DJ Cosmix & Etnica ‎– Kumba Mela E.P. 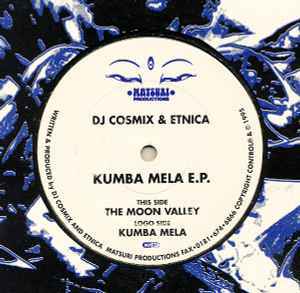 Side A, "Kumba Mela" doesn't need much introduction as it was pretty large back in its day and has since appeared on many compilations. In brief, it is everything you wanted to hear from Etnica back then: awesome melodies, memorable lead and a great bass line to move the party people. It does just that. The B side, "The Moon Valley" is somewhat a more atypical track for that era: it starts of kind of minimal and dark, with only the bass line and the kick going for the initial two minutes and some change. Only then does a lighter background melody sneak in, accompanying the aforementioned bass & kick, but it isn't up until the fourth melody that a lead quitely sneaks in. You'll hardly even notice. It's only around 05:20 that the lead explodes, and then makes way for the track's slow outro, ending in the same fashion it started in. Not necessarily an essential release, although a worthwhile addition to your Etnica collection. The tittle track, however, is well worth owning, though it might be easier tracking it down on some various artists compilation.